It's official! Robert Downey Jr. is joinging Spider-Man: Homecoming. When the new trailer for Captain America: Civil War debuted last month, it gave us our first look at Tom Holland as the new Spider-Man, who will go on to star in Marvel and Sony's reboot Spider-Man: Homecoming. The trailer featured Robert Downey Jr.'s Iron Man calling out for the web-slinger, who steals Captain America's shield before swooping in to introduce himself. Today we have a new report which confirms the old rumors that Robert Downey Jr. will be reprising his Iron Man role in the upcoming Spider-Man: Homecoming. The news isn't terribly surprising, since footage from Captain America: Civil War shown at CinemaCon last week featured Peter Parker (Tom Holland) coming home to find Tony Stark (Robert Downey Jr.) in his living room with Aunt May (Marisa Tomei). 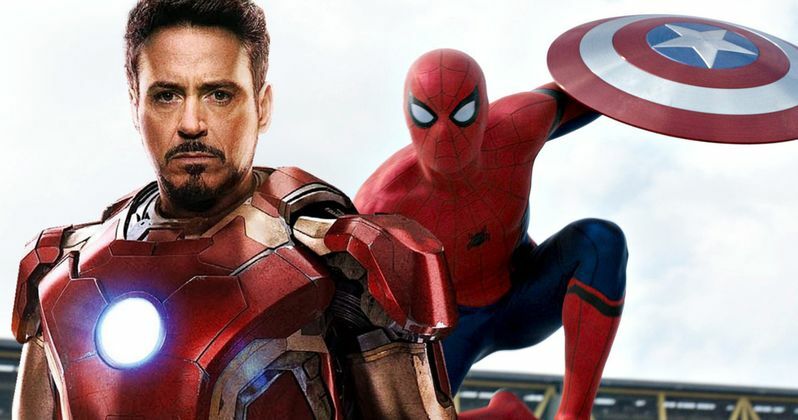 When the new Spidey role was being cast, Tom Holland and other candidates were flown in to the Atlanta set of Captain America: Civil War, to read with both Robert Downey Jr. and Chris Evans. Deadline is also reporting, though, that, while the Spider-Man reboot has gained Robert Downey Jr., the project has also lost Michael Keaton. We reported last week that Michael Keaton was being sought to play the main villain in Spider-Man: Homecoming, who has been rumored to be Vulture. This new report reveals that the actor has fallen out of talks with Marvel and Sony, as the studios continue to search for the right actor to play this unspecified villain. It isn't known when production will begin on Spider-Man: Homecoming, but both Marvel and Sony have already set a July 7, 2017 release date. Marvel Studios President Kevin Feige has already confirmed that it's possible other Marvel characters could appear alongside Spider-Man, but as of now, Iron Man is the only one who has been confirmed. There have also been rumors that Spider-Man: Homecoming will be the start of a new Spidey trilogy, which is set within Peter Parker's high school years. The project will forgo the origin story previously told in the original Spider-Man trilogy and The Amazing Spider-Man reboot movies, with Peter Parker already established as the wall crawler, as he juggles his crime fighting activities with his school work. The studios' plans for a trilogy have not yet been confirmed at this time, so we'll have to wait and see. Robert Downey Jr. joins a cast that also includes Zendaya Coleman, who signed on recently to play a character named Michelle, along with Laura Harrier as an unspecified high school student and Tony Revolori as Peter's schoolyard enemy Manuel. Jon Watts (Cop Car) is directing Spider-Man: Homecoming from a script by John Francis Daley and Jonathan M. Goldstein (Vacation). We'll be sure to keep you posted with more updates on Spider-Man: Homecoming as more details and cast members are announced.